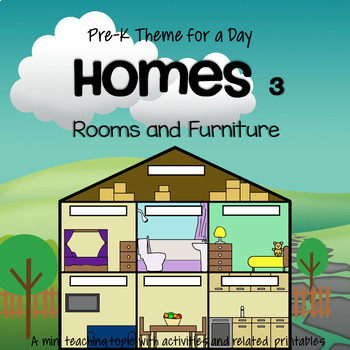 The teaching theme focus for this packet is homes and houses, with the emphasis on Rooms and Furniture.. This is third of 3 units about homes. • Anchor poster showing a house and its rooms. •	Cut and paste: Design a living room. •	Trace and color a house. •	Emergent reader. Look for a teddy bear in rooms of a house. •	Patterns printables – color the patterns to make them different, and connect the pattern pairs. 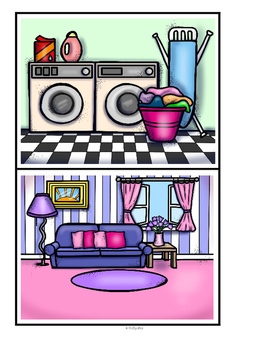 •	Word wall picture/vocabulary of things found in a house. 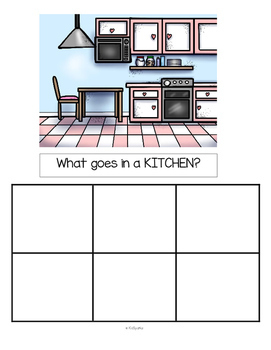 This can also be used as a Read the Room activity, with a recording sheet included. •	Lotto or concentration game – print 2 copies. 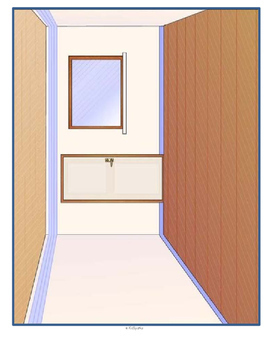 Also, ask which room you would be likely to find each item. Encourage discussion. •	Number strip puzzles (2) 1-5. Print 2 copies, cut up one and match to the other. •	Set of furniture large manipulatives to use for vocabulary, recognition, small group games, and critical thinking. - Rhyme printable - children draw picture of a home. - Categorizing pictures of furniture into different rooms. - Set of textile designs to cut up to make a collage.